BurdaStyle Oversized Sweater Hack – Sweater dress with gathered sleeves and gathered side seam options. This sweater dress has gathered tie-up sleeves and the option to gather the side seams also. I can imagine this looking lovely and drapey without a belt on a tall slim person. I’m quite small and bootylicious so I NEED my waist to be defined so I don’t look like I’m wearing a sack! Apologies for the dark fabric. I hope you can still see the images well enough to understand what I’m showing. I have used a wool/acrylic cable knit from Textile Traders for this garment. So this is the original pattern. I simply put them together as they were intended to be sewn, traced over the top, added some length to make it the length I desired and re-cut the shape. Next, I eliminated the pockets from the back and ensured that the length and shape was consistent. I did this by laying the front pattern piece underneath the back pattern piece so the shoulders were matching and again traced over the top. Then I altered the sleeves to the desired shape. This time, I wanted the sleeves to create a bit of a ‘batwing’ so I left the top as it was and tapered the sleeve in towards the wrist so it would be fitted. Now you’re ready to cut your pattern pieces out. There will also be a neckband and 4 ties, so you will need some fabric for these pieces too. To create the gathered tie sleeves and side seams, I used bias binding and attached it to the inside of my seams. Begin by sewing it face down along the seam edges. Flatten out the fold on the fabric edge and stitch along the fold line. This will later be caught in your seam. The other folded edge should be folded under towards your fabric. This will be stitched on later. Ensure that the top and bottom edge of the bias binding are folded under to leave a clean finish. Don’t extend your binding all the way to the end of your fabric or there won’t be room for your hem. I have left a split hem at the wrists and bottom of the dress to accommodate the ties. Once your binding is secured, you may choose to finish the edges of your fabric with an overlocker/serger as I did. Next pin the shoulder seams together, right sides of fabric facing and sew together. Press the seam allowances to the back. Place a pin at the top and bottom of the side seams to indicate where to stop sewing. Sew the side seams and iron seam allowances flat. Finish the fabric edge along the bottom of the skirt hem and then pin the seam allowance of the side seam. Sew along the edge of the seam allowances to finish the side seam slit at the bottom of the skirt hem. Now fold up, press and hem the bottom of the skirt. I usually use a twin needle to hem stretch fabrics. I didn’t this time, but wish I did. I must have been too lazy to change the needle! lol The twin needle makes such a difference as it reduces the permanent stretching of the fabric. A walking foot helps also. Then give the hem a really good press with the iron. Repeat the steps for the side seams and skirt hem when sewing the sleeves. Attach the sleeves, matching the front and centre top sleeve marks as shown in the original pattern. Now comes the fun part! Inserting the ties. Cut 4 strips of fabric long enough to match the length of the bias binding you used. Fold in half lengthwise and then stitch along the long edge. Use a looping tool to turn the currently inside out tie, in the right way. Pin one end on the tie to the top of the bias binding on the inside of the sleeve and then pin the lengthwise edge of the binding down, ensuring to trap the tie inside it’s tunnel. Carefully sew in the binding beginning at the sleeve hem, up the sleeve, across the top of both bindings making sure to sew in the top of each tie and down the other open binding edge towards the hem. Be careful not to catch the tie along the lengthwise edges as you are stitching the edge of the binding. Repeat for the side seams. Next, measure the length of the neckline all the way around (or the circumference). I usually make my neckband 2/3 the actual length of the neckline when using stretch. This ensures I don’t end up with a floppy or warped neckline! Cut a piece of fabric 2/3 the length of the neckline, with the stretch going lengthwise across the fabric. Sew the short edges together, right sides facing. Fold in half lengthwise wrong sides facing and press. 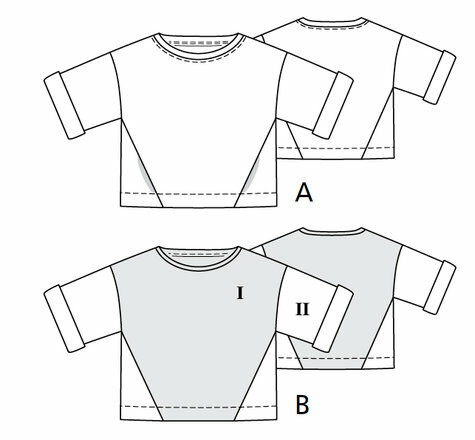 Find the centre front and back points by folding the neckband and the neckline on the garment. Place a pin or mark each point. Attach the neckband matching the centre front and backs. Stretch the neckband and pin in place around the edge of the neckline. Sew in place. Press seams down towards the bottom of the garment. Give it all a good press and you’re finished! !